Leatherwolf - back in the 80's - was the motive for a hard rocker to occupy himself with the U.S. Metal music; in addition, the band was the 'drive' for a 'core' Metal fan to keep an eye on the Hard Rock scene of the States. Leatherwolf boasted a roster of fans with initial likes for bands such as Dokken, Ratt and Lillian Axe (on one side) and also Queensryche, Oliver Magnum and Armored Saint (on the other side). I can remember the mighty Fifth Angel possessing the same charisma, back then. Some 'obscure' trivia: in one of Leatherwolf's 1982 live gigs in the broader area of Los Angeles, CA the support slot did come from none others than the 'promising' Metallica. Hell yeah! Seriously: a total of three albums did this extraordinary 'harmony' Metal band release in the 80's, all of them being brilliant. 1984's Endangered Species - originally released as a same-titled EP via Tropical Records, the next year to receive a worldwide LP release via the Heavy Metal label - was a fine, straight Heavy Metal debut while the best were yet to come. 1987's Leatherwolf and 1989's Street Ready (both on Island Records) did manage to receive global recognition, with the 1987 album being considered in our days as one of the best excerpts of U.S. Metal music of all time. Colossal melodies supported by blistering guitar riffs, massively harmonic yet stiff vocals and a solid bass/drums rhythm section was the formula and it was a pity Leatherwolf called it quits in the early 90's. …will surely divide the fan base. 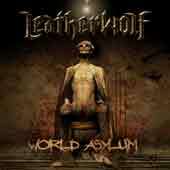 Explaining: World Asylum does have little of resemblance to the typical 80's Leatherwolf style. Of course, lots of ideas/parts are obvious in the tracklist, still there are two crucial factors that 'shape' this album's personality: a) (of course) the vocal 'approach' of Wayde Black is completely different in regards to original frontman Michael Oliveri. Black's 'harshness' is in separate status from Oliveri's 'velvet' vocals, b) The song writing is somehow different than in the band's previous works (ok, I know it's been 17 years). A lot more of 'post' mid-90's U.S. Metal (with the relevant production) did I hear in most of the songs. Hey, they are good by the way! Imagine a mix of (post-Fighting…) Warrior, (late) Armored Saint and 'un-sophisticated' Helstar and you got the picture. Speaking of the album's production - done by Warrior guitarist Joe Floyd, while Jacob Hansen mixed the album at Hansen Studios in Denmark - surely does justice to the songs. So does Wayde. Yet, it's the songs themselves that will lift you up or put you down (it depends on the taste you have). Therefore, 'upgrade' my rating if you would like the band adapting themselves to the circumstances and keep the rate if you'd like something to memorize the glorious 80's days of the wolves in leather (well, Behind The Gun does suit fine to this occasion). P.S. Leatherwolf were the first Metal band to feature three guitarists on a permanent basis. This, due to the lack of information regarding some other (enormous, anyway) Metal act.